The term competition refers to a situation where two or more parties fight it out in the market for better share and gain. To get the better of the other, a business has to be proactive, dynamic and nimble. To out think, to act and adapt faster a business must acquire and harness its knowledge resources. When knowledge answers, businesses often innovate. Innovation well supported by knowledge help companies raise the bar and be competitive. Hence it is imperative, for companies that aspire to grow their businesses, to embrace knowledge and innovation. Let’s dwell a bit on achieving competitiveness in an established market. We all know that a company can gain an edge over its competitors by achieving one or more of the follow viz., superior quality and service, Cost advantage, Ease of use and Aesthetic design. The following mind map captures various requirements for achieving each of these aspects of competitiveness. Take a closer look at each of the requirements in the above map and try to figure out the role of knowledge in achieving them. A company that is aware of its knowledge repository and makes full use of it would keep delivering on all fronts and continue to grow. Knowledge has its roots in learning. It is through learning that one builds up and strengthens his or her knowledge base. An encounter with a customer in an airport can open up a new way to serve and expand business. A business should identify all the available channels and points of learning to tap and convert that learning into a knowledge resource. Some can be accidental but many can be by design. A company accumulates knowledge through its people, who learn and gather knowledge through various sources, in various ways and for various purposes. Knowledge thus gained should help a company to sharpen its competitive edge by improving processes, technology and the overall business performance. However not all willingly share knowledge for the greater benefit of an organisation. Two big challenges of knowledge management are making people share and use knowledge. People, behind technology, beside machinery, in the cubicles, and those in the field make things happen in this highly competitive world. The knowledge they accumulate is vital for a company to grow. They learn and accumulate knowledge by doing, observing, questioning, reading, listening and brainstorming. The onus is on a company to make the best use of its knowledge assets. Knows that knowledge acquired for business does not automatically translate into knowledge used in business. Like a plant, knowledge requires a conducive environment to thrive. Any effort towards knowledge management must keep the major stakeholders (employees) of knowledge into consideration. A mere installation of knowledge management software won’t suffice. Men distinguish themselves from the rest with the knowledge they possess. Asking them to share that knowledge with others to the common benefit requires greater commitment and a genuine system. Even after that it will be a tough task. The following question can stop one on his tracks. Who is responsible for the outcome, if I use other’s knowledge? This is where a comprehensive and well communicated KM system comes in handy for a company. 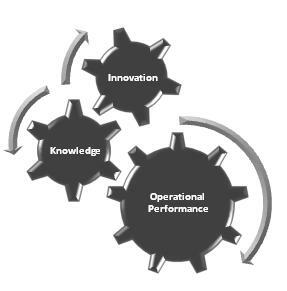 The following are imperatives for a successful knowledge management system. Innovation is an act of starting something for the first time; introducing something new. By innovating we bring something new to the environment. This is how innovation is defined in dictionaries. In business, innovation often is associated with new products and services. However it can also be associated with new processes, practices, methods etc. that improve core operational parameters viz., cost, quality and time. To innovate one needs to think and capable of thinking differently. It’s a combination of attitude and knowledge that breeds innovation. Innovation needs right climate and support. It cannot happen in a choked environment.